Pof.129Px, Black numerals 12f green / black, combined perforation 15, wmk Px - leftwards, overprint type I.; at top partially repaired gum, nice piece, certificate Vrba and Philatelic Foundation NY, exp. by Mrnak., very rare stamp, cat. ca. 140.000CZK! Pof.130Pw, Black numerals 50f green / black, line perforation 11½; : 12, wmk Pw - vertical, overprint type I.; hinged, left lower repaired tooth, otherwise nice quality, certificate Vrba, exp. Tribuna, Fischmeister, Möbs, Kovar etc., very rare and sought stamp, cat. 70.000CZK! Pof.173B ST, 100h red as block-of-4, HORIZONTAL joined types II. + III. and as well also vertical, combined perforation 13¾; : 13½; CDS PODMOKLY 1/ 5.XI.24; fine, certificates Vrba and Karásek, exp. Tribuna, Hirsch, unique block with horiz. and also vert. joined types, ex. Karásek! 1929 first flight UZHHOROD - PRAGUE, Reg and airmail PC to Uruguaye 1. flight Uzhhorod - Prague, with Pof.L6, 187, 213 2x, 238, posting frame cancel. UZHHOROD AIRPORT/ 6.V.29, CDS UZHHOROD/ 6.V.29, transit PRAGUE 82 AIRPORT/ 6.V.29 and on reverse arrival postmark MONTEVIDEO/ 25.V.29; good condition, rare destination for period of II. air-mail issue! 1918 POSTAGE STAMPS / VELKÝ FORMÁT Mi.203b, Coat of arms 10K dark violet, blk-of-9; on 2 stamp hinged, other **, big blocks this the highest values are very rare! 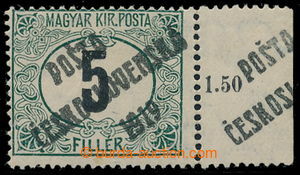 1919 EXPRESS TROJÚHELNÍK + OBDÉLNÍK / unpaid card with mailing nationalized CDS RYCHNOV N. K./ 16.I.19, burdened with postage-due, which/what was/were paid mixed franking Express stamp. triangle 5h green, pair with right coupon polovičního format (! ), other same samostatnou stamp. 5h, Spěšnou rectangle 2h and postage stmp Crown 3h violet, Mi.218 3x, 219, 185, all with black overprint "T", nationalized CDS VELKÁ VES ČES. SEV. CDS. 17/1 19; good condition, exp. 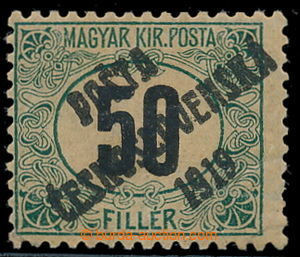 by Karasek., usage invalidated Austrian trojúhelníkových express stmp post used as stamp. postage-due, here in addition with coupon! 1918 EXPRESS OBDÉLNÍK postcard franked with. 5-tuple franking Express stamp. 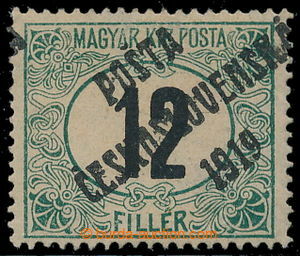 2h rectangle with line perforation 11½;, Mi.219B used as postage stmp, CDS MORAVSKÁ OSTRAVA/ 28.XII.18; only small toned in perforation, exp. by Karasek., cat. Hirš evaluates - , -, quite rare franking parallel stamp. with rare perf! !